Chris Wilder has held talks with Che Adams to discuss his future at Bramall Lane as Birmingham City consider making a third approach for the England youth international. 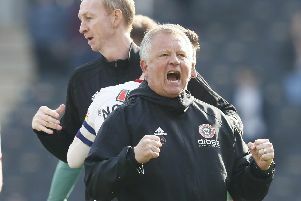 Sheffield United’s board of directors rejected an improved bid from Gary Rowett’s side towards the end of last week and Wilder, the League One club’s manager, responded by selecting Adams in the team which beat Handsworth Parramore 5-1. Adams, who scored during United’s final warm-up fixture ahead of Saturday’s meeting with Wanderers, commanded an undisclosed sum after leaving Ilkeston in 2014. Although Rowett is privately convinced the 20-year-old would be interested in exploring the possibility of a move to St Andrews, he has so far been unable to tempt United to the negotiating table. City’s latest proposal, which is believed to contain the promise of a sell-on clause and around £500,000 worth of performance related payments, fell short of United’s valuation of a player who made 41 appearances last season. Wigan Athletic and Huddersfield Town are also known to have monitored Adams’ progress in recent months although sources close to the John Smith’s Stadium insist David Wagner’s team has now concluded its business during this summer’s transfer window.